"A twist on an old classic. This is kind of messy but soooo good. Looks like an appetizer but eats like a meal. The whole family loves it and the stuffed noodles can be frozen and used at a later point." Heat a large skillet over medium heat. Add beef and Italian sausage; cook and stir until browned, about 8 minutes. Drain excess grease. Let cool slightly. Bring a large pot of lightly salted water to a boil. Cook manicotti shells in the boiling water, stirring occasionally until tender yet firm to the bite, about 7 minutes. Drain. Mix cooled beef and sausage, cottage cheese, 1 jar pizza sauce, and mozzarella cheese together in a large bowl. Stuff shells generously with mixture. Arrange stuffed shells on a baking sheet and freeze until firm, 15 to 20 minutes. Cut each shell into 2 or 3 lasagna pieces. Place flour in a bowl. Beat eggs in another bowl. Pour bread crumbs onto a shallow plate. Dredge stuffed lasagna pieces in flour. Dip in beaten eggs. Roll in bread crumbs until coated. Fry 4 breaded lasagna pieces at a time in the hot oil until golden brown, 3 to 5 minutes. Repeat with remaining pieces. Pour remaining jar of pizza sauce into a bowl for dipping. Here's a quick and easy way to use up leftover stuffing. 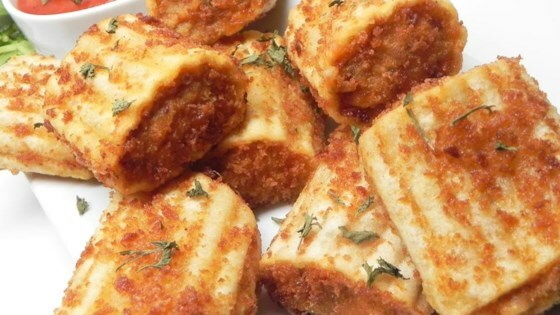 Use plain or Italian-seasoned bread crumbs as desired.